You have found the hidden treasure of Mapua, Golden Bear Brewery. Located at the historic Mapua Wharf, Golden Bear Brewing is a great place to savor craft brewed beers, chill with friends and enjoy fresh Mexican food. Live music events light up the Wharf all season long. 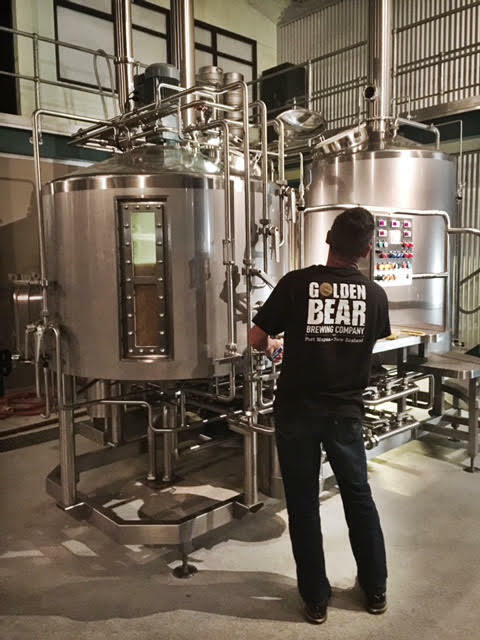 Golden Bear Brewing is the creation of Jim and Anne Matranga. Born in Los Angeles, CA, Jim worked as a cabinet maker and ran his own millwork company for over 25 years. Anne helped manage small and large architectural firms for more than 10 years. In 1994 the couple traveled to New Zealand for the first time. Jim says, "We fell in love with the land but found the available beer to be uninspiring. I half jokingly suggested I would learn to brew beer when we got back home and after mastering the art we could move to New Zealand and raise our family." They moved to New Zealand in 2005 and stumbled upon a rotting steel shed full of stored junk, located at the historic Mapua Wharf and envisioned the future site of Golden Bear Brewing Company. After two and a half years of planning, consents and construction, Golden Bear Brewing opened on Labor Day - October 2008.